Our annual Christmas Benefit Concert has become a traditional "must-attend" for many families. In the early part of December (usually right after the Tannenbaum Express), we perform our Annual Christmas Concert for the benefit of the Salvation Army. This is a very special performance, as we are joined by the Chantelles, a ladies chorus. Each of our groups performs our own numbers, and then we join together in one large chorus to perform some unique songs of the season. Our rich sound and harmonies will give you goose bumps. donation of non-perishable food items or money which go directly to The Salvation Army. .Your donations are greatly appreciated by those in need during this joyous time of the year. Make this concert an annual tradition for your family and friends. 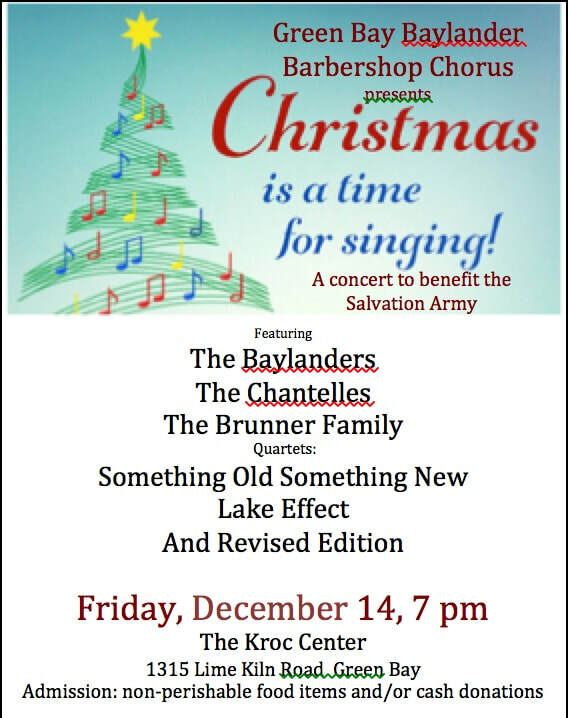 This year's concert was on December 14th at The Kroc Center in Green Bay at 7pm. Our Tannenbaum Express took place in December 15th.